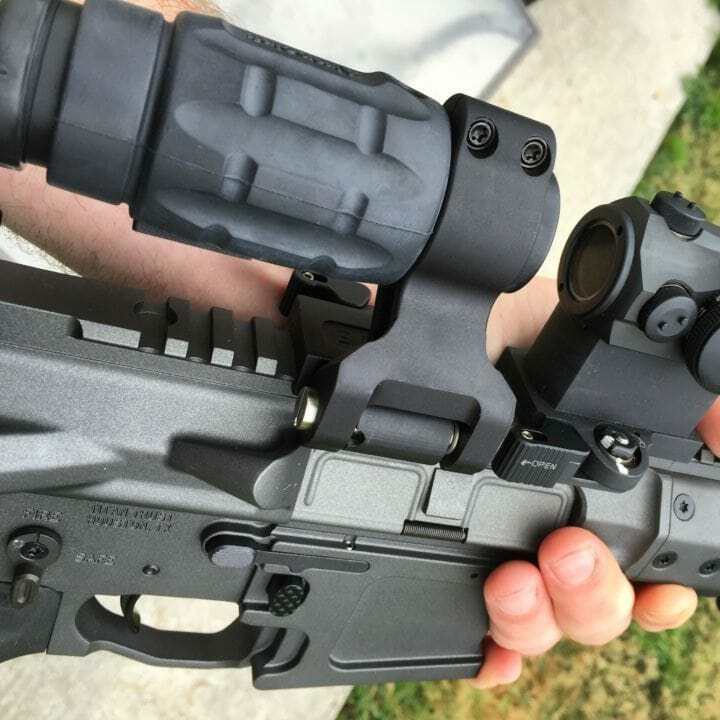 The magnifier installed on the AR-15 along with the red dot sight is used to enhance sighting for a long-range, larger image. In general, the red dots are good for close range applications for both hunting and combat. 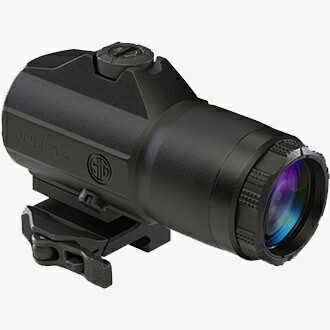 The magnifier, however, changes the game and turns the basic red dot into a far better distance system. These range-adapted magnifier units come in a variety of sizes, types, and price ranges. Depending on your needs, a sight can be adapted to accommodate your preferences. As a combination mount and optic, this flip mount VMX-3T Magnifier adds 3X magnification to your standard red dot sight. With simple and fast operation, the sight flips with just the push or a button. This one simple movement engages the magnifier and you are ready to go. The fully coated and protected lens increases sensitivity to low light conditions or bright light conditions. This feature makes it effective for field or range shooting. The system allows the shooter 3.25 inches of eye relief and produces 38.2 feet in the field of view at 100 yards. 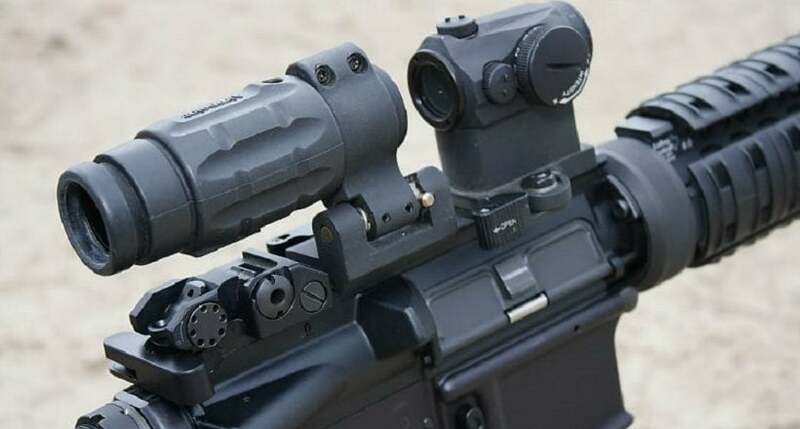 This optic will not require special sighting in and can be adjusted to your red dot sight by screws set at the base of the magnifier. Any shooter who wants to increase the effectiveness of their basic red dot, VMX-3T should be his first choice. 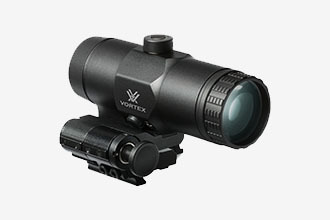 The price of Vortex VMX-3T Magnifier varies, so check the latest price at Amazon. This sight is designed to mount directly on a Weaver style/Picatinny rail mount base. 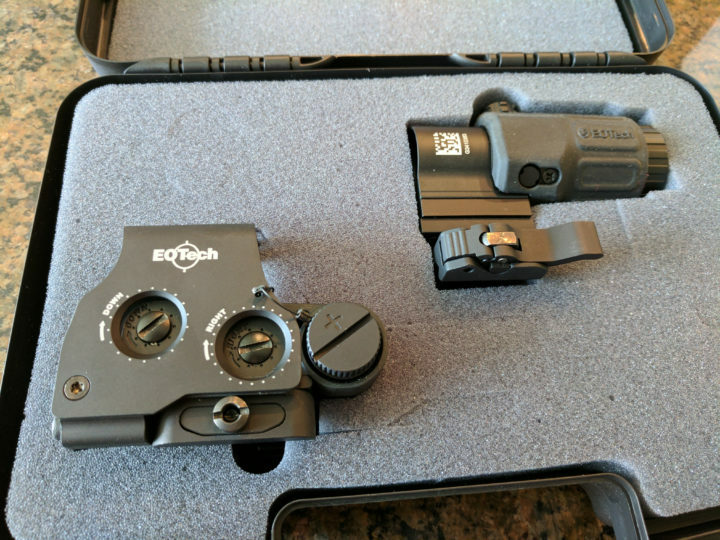 The sight can be flipped to the side with aftermarket mounts, but it comes with a unique Aimpoint twist mount that is accurate, quick to install and easy to use. The magnifier can be also mounted with 30mm rings and is NVD compatible. 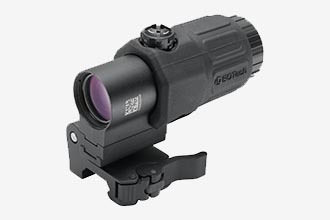 This unit retains a full 3X magnification ability and has been designed for use by military, police, and sport shooters. In general, the gunfighters are the primary customers when this type of system is installed. It is the shooter's choice when selecting a different sighting system. In my case, I prefer to lock on a bigger rifle scope when greater magnification is required. Overall, there is less carry weight or at least no additional weight to carry in the field. Of course, the price needs to also be considered here. Combat target shooters require a system like this for some games. Military applications need not to be judged by me. 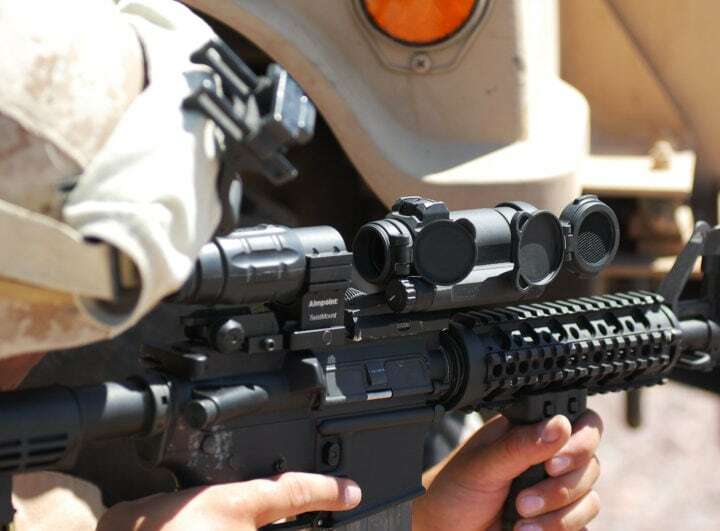 As a combat added sighting aid, the system allows the soldier or police officer to engage the bad guys with low power red dot sight. When more range to the sight system is required, a flip of the switch takes care of that need. If you have a sniper at 190 yards on the roof, that is no problem. The optic gets very high marks among shooters. This is a military grade sight and is often used by professional operators, active service military, and law enforcement agencies. This unit features high-quality glass materials and housing construction. 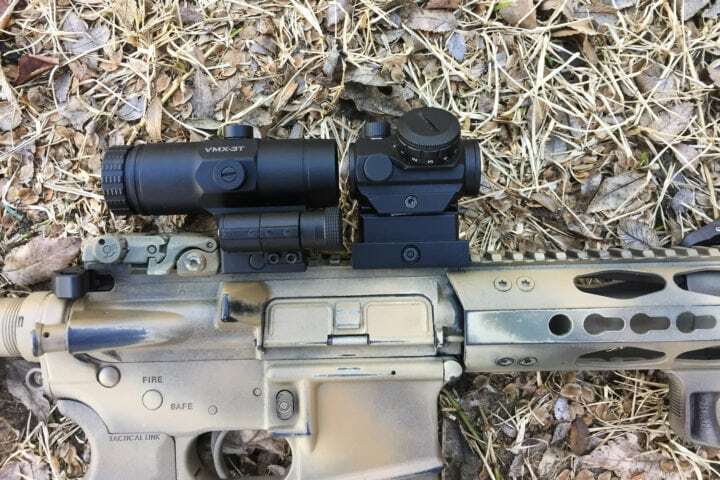 Aimpoint engineers would not sleep well at night if they even thought that their sight aid would let a ground pounding Army Ranger down out there in combat operations. 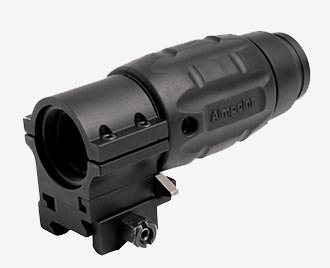 The price of Aimpoint 3X varies, so check the latest price at Amazon. This unit is designed for general use when increasing red dot flexibility at long ranges. The system makes use of elevation and windage adjustments so you can center your red dot sight correctly through this device. This unit will work on the standard red dot or reflex sight systems and mount with standard rail type hardware. An integrated diopter provides fast focus ability that helps keep the image clear. 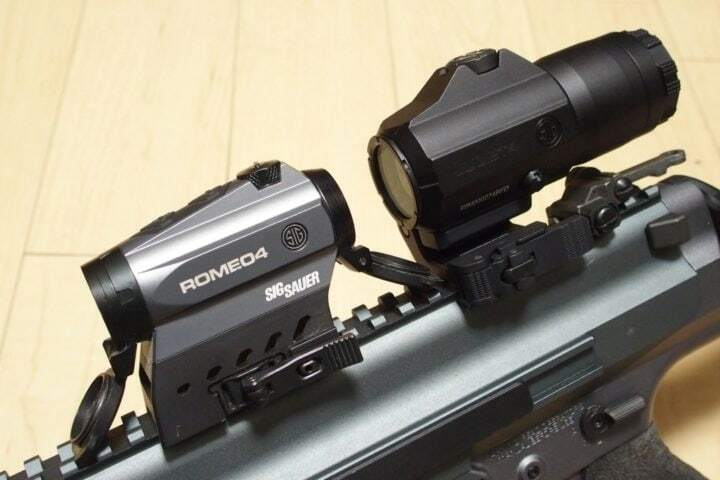 My friend's views were also in favor for this magnifier in terms of quality and its ability to perform well down range. The price of Primary Arms 3X Magnifiervaries, so check the latest price at Amazon. This red dot magnifier features a tool-free azimuth adjustment system, a larger field of view, and an adjustable diopter. The system makes use of an increase in light transmission and puts some others to shame in this area. The housing on the unit is very well made. It is rugged for run and gun or real-world combat situations. 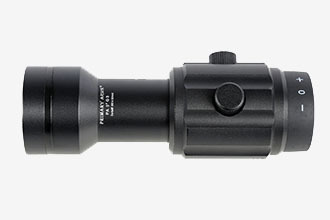 Operators, military, and police should definitely consider this magnification system. 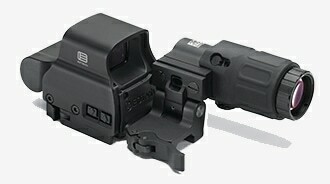 This is the third generation of the EOTech L3 magnifier. It offers more eye relief and windage with an increase in elevation. 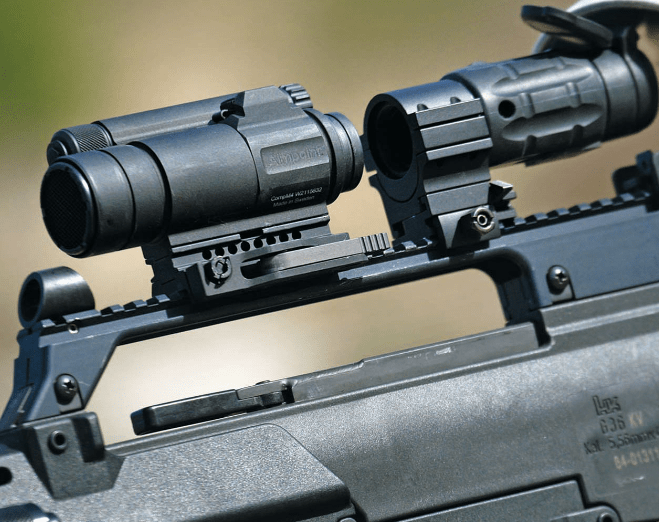 The magnifier aligns perfectly with standard height sights used on AR-15/M-16 rifles. The price of EOTech G33 varies, so check the latest price at Amazon. 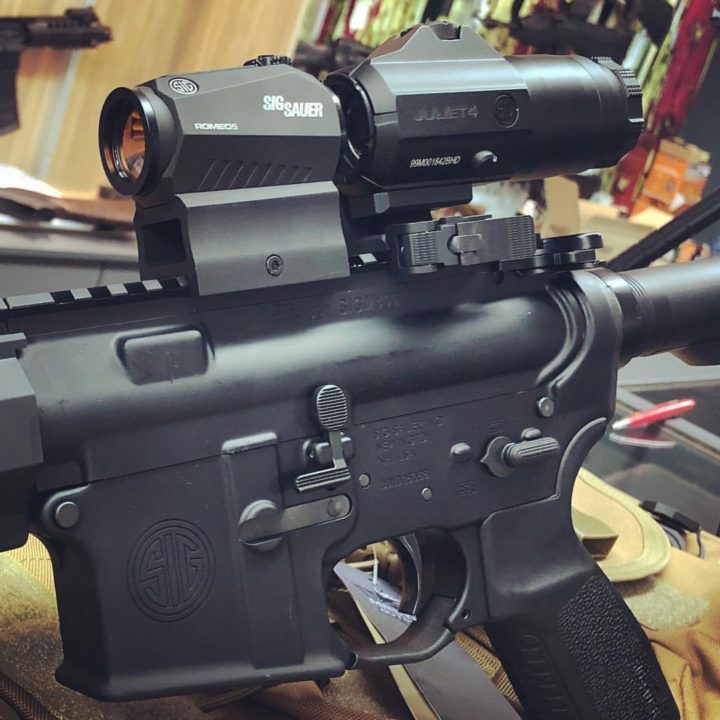 If you're going to go with a magnifier and you're a professional contractor, a security detail private operator, or even a combat target shooter, you may want to consider taking a look at the combined magnifier and hybrid holographic sight. 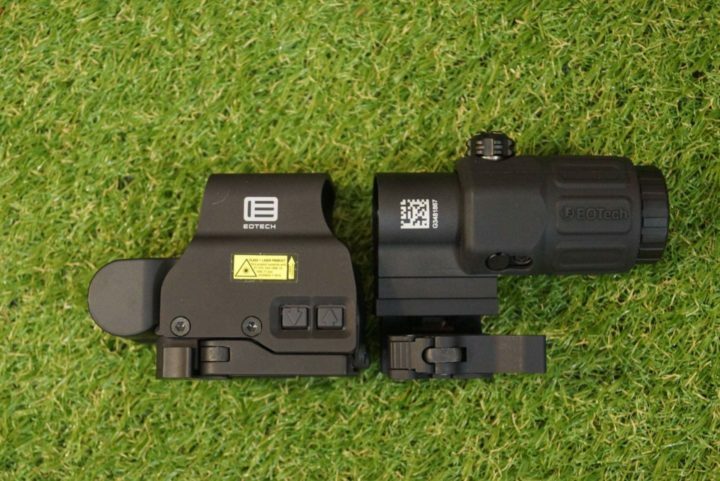 This set up combines a G33 magnifier and EOTECH EXPS2 S holographic sight. I think this is the best deal because you now have the whole ball of wax in one bundle. All components match under the same brand and are built to work as a unit right out of the box. This makes a quick transition from mid-range to close-quarter shooting situations. The mount fits standard Weaver rails. This system makes use of a side button function for both speed and accuracy during a shooting transition. The Mount Quick detach level fits 1” Weaver and Mil-STD-1913 rail. 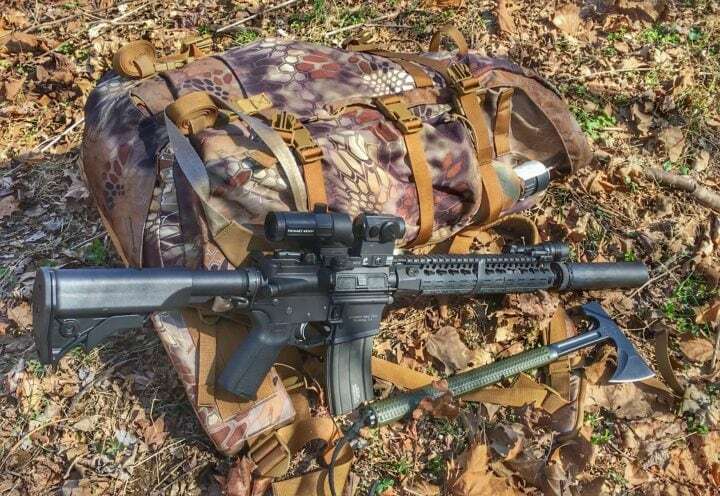 This is a professional level sighting setup. The price of EOTECH HHS II varies, so check the latest price at Amazon. This unit is designed to work as a stand-alone system or in conjunction with a reflex optic. This unit is adjusted by way of spaces for exact height when aligned to the primary red dot sight. By using the Powercam at 90 degrees, it can be flipped out of the way in an instant. 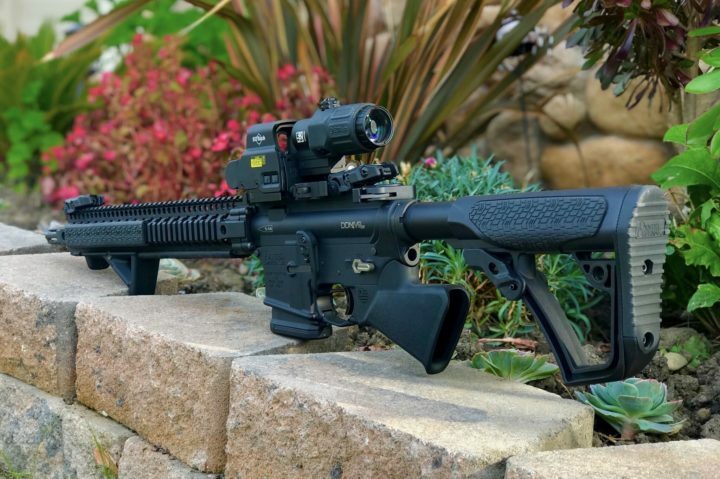 This sight is not a budget optic. However, when compared to the Mil-Spec options that are designed for professional applications, it is affordable. Want to take a whitetail in an eastern wood for winter meat? Run and gun some called coyotes in the dead of a Minnesota winter? This unit can get the job done and still move into action for more aggressive roles. The unit's housing is aircraft grade aluminum that will give you a lifetime of serviceability. This waterproof scope receives a rating of IPX 8. The red dot sight can withstand being submerged for up to one hour at 20 meters. However, if you are down there with the optic, your troubles are far greater than those of a leaky sighting system. The price of Sig Sauer Juliet4 varies, so check the latest price at Amazon.